Public Beta of "Public Contact List"
I’m hosting a server for the while being for some (another) software I wrote for Messenger. The name should already tell you what it’s for. Feel free to submit issues, suggestions etc. Also I wanted to point out something. I planned to make a Messenger Plus Script for it. 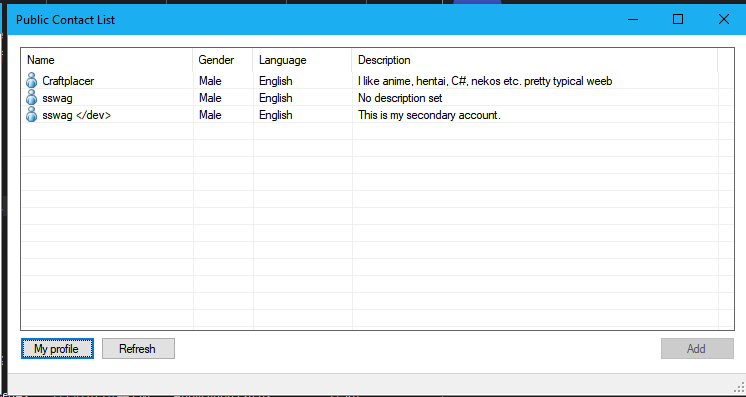 But since MessengerPlus didn’t want at the point of making an UI I scrapped it. Can’t MsgrPlus read users’ name and personal message? It can but I said, additional information outside of Messenger. Things like Language (might be able to auto detect) and Gender. and a bunch of other stuff if users request that. But I like your idea of a MsgrPlus plugin of adding the PSM to there, so I will do that today. I’m adjusting the API to allow single information changes. Well, as you said, it could automatically detect the language of the conversation history file. problem will be that I have to do a lot of JScript work arounds to get such advanced things working. This looks like a really useful tool to be brought to the Escargot community. Maybe even one of the most useful tools yet. If there is a possibility to somehow import all the contacts that have already been made available through Contacts sharing threads in MessengerGeek such as these (1, 2, 3), the list will get bigger pretty quick. Would there be a way to sort the list by Language, so people can easily add others that speak their idiom? Having a “sort by last logged in” would be really useful aswell. That’s exactly what I asked, people suggest what should be added. I still want to add the script/plugin to Messenger, to make stuff even better.